We understand that filing for bankruptcy can be a very confusing and intimidating process. That is why we work so hard to make the process as easy as possible for our clients. 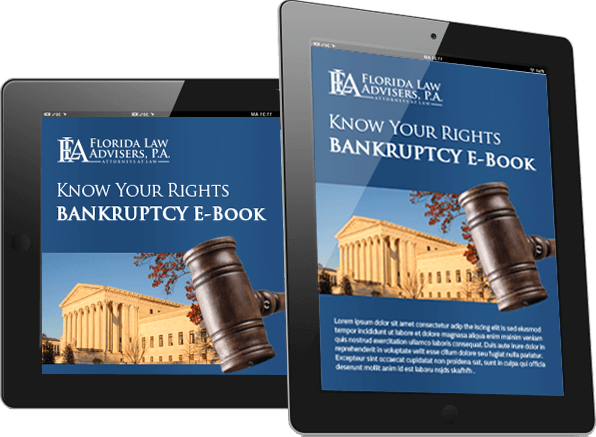 When you hire Florida Law Advisers, P.A., you get experienced bankruptcy attorneys by your side throughout every phase of the bankruptcy process. We will help you ensure your rights are protected, keep you well-informed every step of the way, and help you receive the utmost protection bankruptcy can offer. The initial consultation is a two-way exchange of information between you and an experienced bankruptcy lawyer at our firm. You have the opportunity to explain your current situation to us and discuss what you hope to gain by filing for bankruptcy. In return, we will explain how the bankruptcy process works and propose comprehensive, personalized solutions to solve your financial troubles. We will fully explain each possible legal option available to you, including the advantages and drawbacks that may occur with each proposed course of action. At the end of the consultation, you should have a firm understanding of all of your options and be confident in deciding which course of action is best for your needs. Whether you decide to file for Chapter 7, 13, 11, pursue negotiations with your creditors, or do nothing and weather the storm, you will never be charged for the initial consultation and everything you discussed with us will remain confidential. Current bankruptcy law requires debtors to complete two credit counseling sessions, one before filing for bankruptcy and another session after submitting the petition for bankruptcy. The credit counseling sessions are conducted by nonprofit credit counseling agencies that have been approved by the U.S. bankruptcy trustee. Florida Law Advisers will provide you with a list of approved counselors in your area for each counseling session. The credit counseling should last for about an hour and can be done either in person, over the phone or online. A bankruptcy attorney at our firm will guide you through the credit counseling process and be available to answer all your questions. After we have completed all the necessary documents, petitions, and schedules we file them with the bankruptcy court. Our bankruptcy attorneys will expedite the process by electronically filing the documents with the bankruptcy court. Your bankruptcy officially begins as soon as the petition is electronically filed and you are assigned a case number by the court. At this point, the court will implement an automatic stay. The automatic stay requires all collection actions against you to stop immediately. Creditors and collection agencies will not be able to contact you, garnish your wages, or repossess your property while the automatic stay is in effect. The automatic stay will even put a stop to a scheduled foreclosure sale of your home. In most cases, the automatic stay will remain in effect until your bankruptcy case is discharged. Within 10 days of filing for bankruptcy you should receive a notice setting the date for the meeting of creditors. It is called meeting of creditors; however, in most cases the creditors will not attend and the trustee will be the only party asking questions. At the meeting you will answer questions under oath regarding your income, expenses, assets, and debts. It is usually a very short meeting, lasting only about 5 minutes. The bankruptcy trustee will be in charge of the meeting, and the bankruptcy judge assigned to your case will not be permitted to attend. You do have the right to have an attorney at your side during the meeting and you should take full advantage of this right to ensure you are not asked any improper questions. The discharge of debt releases the debtor from all personal liability to the debt. The discharge is a permanent court order prohibiting creditors from taking any collection action on debts that have been discharged in the bankruptcy. For those filing under Chapter 7, the discharge is usually granted 60 days after the meeting of creditors has taken place. For those filing under Chapter 13, the discharge is typically granted after all payments under the Chapter 13 plan have been submitted to the trustee. We know that the bankruptcy process can be very intimidating. Fortunately, you do not have to go through these steps alone. Our team of skilled and experienced bankruptcy attorneys will be by your side every step of the way. Florida Law Advisers, P.A., is dedicated to providing effective representation, individual attention, and affordable fees to our bankruptcy clients. All of our initial consultations are free and convenient payment plans are always available. Florida Law Advisers, is a customer-service oriented firm with a strong reputation for providing personalized attention and dedicated legal counsel. Regardless if you need help with Chapter 13, Chapter 7, or other debt relief, our professional legal team will provide you with competent legal advice you can trust.